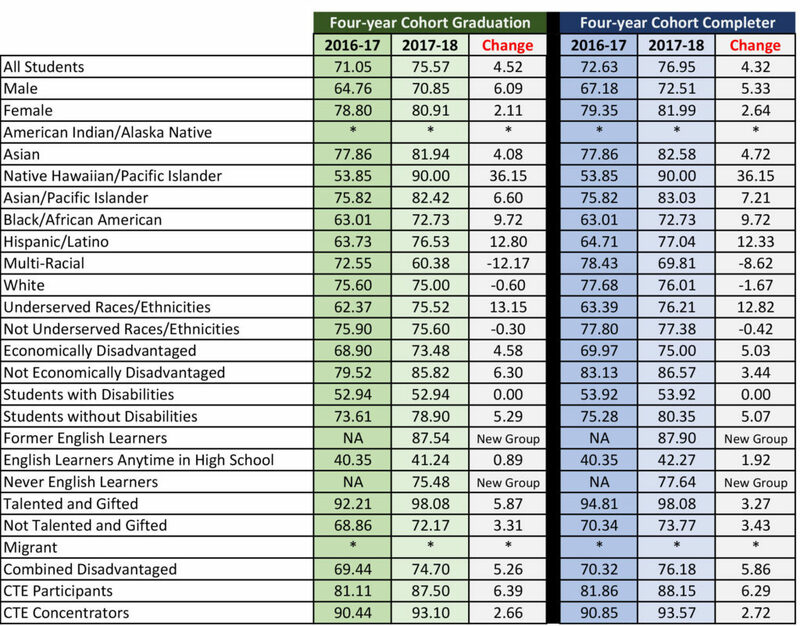 The Oregon Department of Education (ODE) has released graduation rates for the Class of 2018 showing a sharp increase for the David Douglas School District, especially for traditionally underserved races/ethnicities. 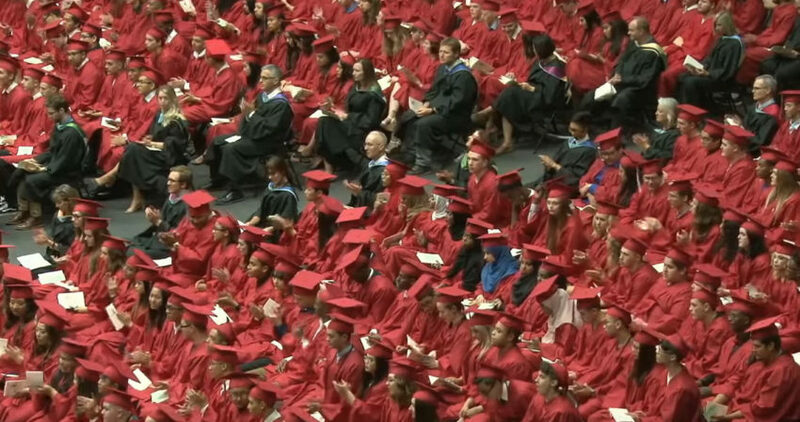 The District’s overall graduation rate last year rose to 75.57%, up 4.5% over the previous year. The overall, 4-year completer rate, which includes GEDs and other alternative high school completion routes, is nearly 77%. 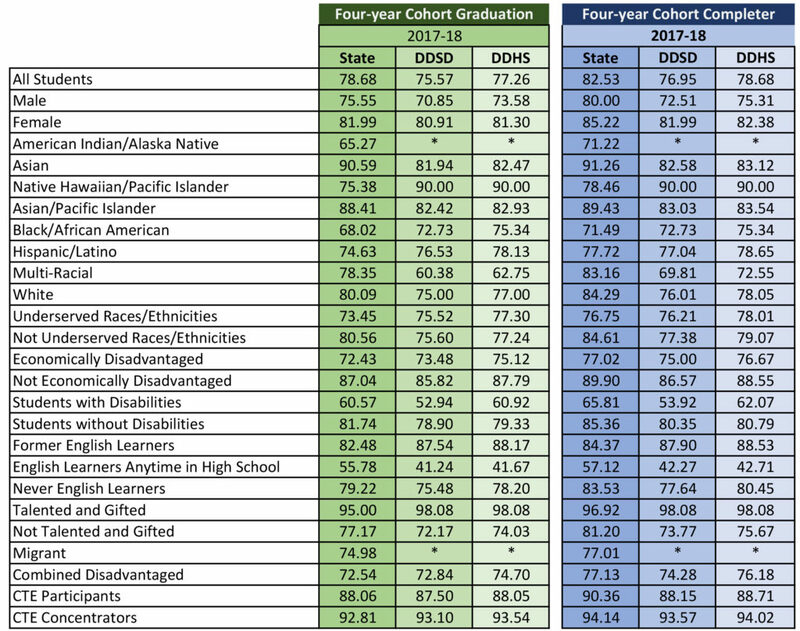 ODE tracks several categories of students, and the District’s graduation rate for ‘Underserved Races/Ethnicities’ increased by more than 13% — up to 75.52% — virtually eliminating the achievement gap often seen between those students and their white peers. Those increases included a nearly 13% increase for Hispanic/Latino students (up to 76.53%) and a nearly 10% increase for Black/African American students (up to 72.73%). Former English Learners — that is, students who at one time were in an ESL program — graduated at rate above 87%. There remains a gap between male and female students, with female students graduating at a rate 10% higher than males. However, the male graduation rate gained ground, growing by more than 6% over the prior year, while the female rate grew by just over 2%. The overall increases continued a 7-year upward trend for the District, minus a one-year dip in 2016-17, which appears to have been an anomaly. District high school leaders point to several factors for the overall increases, starting with staff members who put building relationships with kids “above all else.” District staff put a lot of effort into the social/emotional well-being of students and making sure their basic needs are met so that they are better able to focus on school. Staff also point to several critical partnerships with community organizations, especially culturally specific organizations such as IRCO, El Programa Hispano, the Latino Network, and Self Enhancement, Inc.
Another point of emphasis has been the continued growth of Career Pathways and Career Technical Education courses. These courses help students see a clear pathway and connection between high school and a work future. For evidence, students who take at least one CTE course graduate at a rate of 87.5%, and those who carry a heavy concentration of CTE courses graduate at a rate above 93%. The District also focuses a lot of energy on incoming freshmen, especially those at high risk, to ensure that they are prepared for high school completion. This includes our ongoing 9th Grade Counts initiative, a 9th Grade Academy, and the high school Link Crew, which provides freshmen with older students as mentors. To ensure that the David Douglas graduation rate continues to trend upward, this year the high school instituted an advisory class. Going forward, students will have the same advisory teacher all four years, who will meet with students for 20-30 minutes once a week to zero in on individual academic deficiencies and social/emotional needs. While there is much to celebrate in the latest graduation rate report, David Douglas is focused on the fact that nearly one-fourth of our students do not graduate on time. This is unacceptable for our students and our community. We believe every student has the unlimited capacity to learn, grow and thrive, and with the continued support of our community, David Douglas is committed to unlocking that capacity for all students.